When President Barack Obama announced his plans to shield millions of immigrants from deportation, Congress and the commentariat pilloried him for acting unilaterally. When President Donald Trump attempted to ban immigration from six predominantly Muslim counties, a different collection of critics attacked the action as tyrannical. Beneath this polarized political resistance lies a widely shared belief: that Congress, not the President, makes our immigration policies, dictating who can come to the United States, and who can stay, in a detailed and comprehensive legislative code. 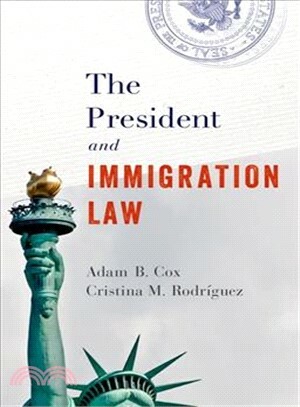 In The President and Immigration Law, Adam Cox and Cristina Rodríguez shatter the myth that Congress controls immigration policy. Drawing on a wide range of sources-rich historical materials, unique data on immigration enforcement, and insider accounts of our nation's massive immigration bureaucracy-they tell the story of how the President became our immigration policymaker-in-chief over the course of two centuries. From founding-era debates over the Alien and Sedition Acts to Jimmy Carter's intervention during the Mariel boatlift from Cuba, presidential crisis management has played an important role in this story. Far more foundational, however, has been the ordinary executive obligation to enforce the law. Over time, the power born of that duty has become the central vehicle for making immigration policy in the United States. A pathbreaking account of the President's relationship to Congress, Cox and Rodríguez's analysis helps us better understand how the United States ended up running an enormous shadow immigration system-one in which nearly half of all noncitizens living in America are here in violation of the law. It also provides a blueprint for reform, one that accepts rather than laments the role the President plays in shaping the national community, while outlining strategies to curb the abuse of law enforcement authority in immigration and beyond. Adam Cox is Robert A. Kindler Professor of Law at New York University School of Law. He is a leading expert on immigration law, voting rights, and constitutional law. His writing has appeared in the Yale Law Journal, Stanford Law Journal, Journal of Law and Economics, and many other scholarly publications, and has been covered by the New York Times, the Los Angeles Times, and others. Cristina M. Rodriguez is Leighton Homer Surbeck Professor of Law at Yale Law School and a nationally recognized scholar of administrative, constitutional, and immigration law. Her work has been published in numerous academic journals, including the Yale Law Journal, the Columbia Law Review, and Daedelus. She also has appeared regularly in media outlets, including National Public Radio, The Washington Post, The New York Times, Democracy Journal, and Forbes. Beyond academia, she served as Deputy Assistant Attorney General for the Office of Legal Counsel in the Department of Justice during the Obama Administration and clerked for U.S. Supreme Court Justice Sandra Day O'Connor.